Thomas Cook Airlines is one of the biggest leisure airlines in the UK, with a fleet of 31 planes, flying from 20 airports across the country to over to 60 destinations around the world. 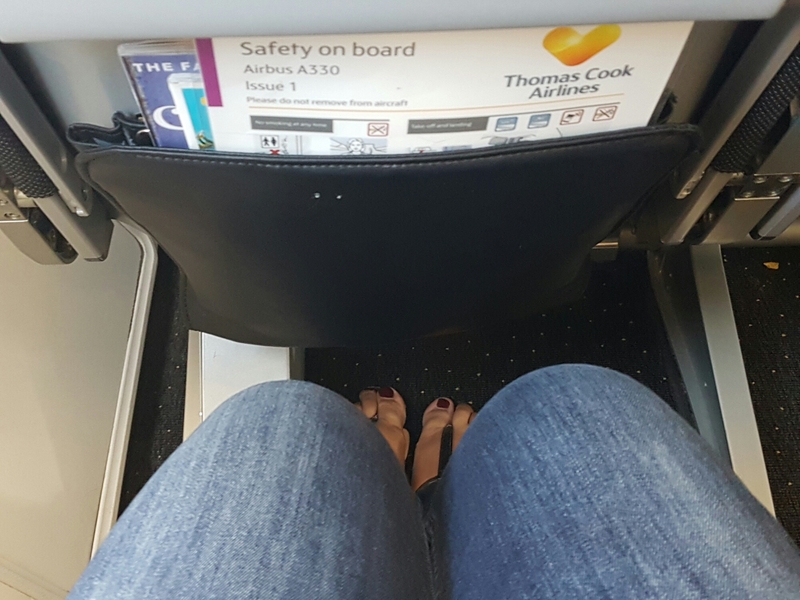 This is my long haul experience, flying non stop from London Gatwick to Cape Town South Africa, on a fully refurbished Thomas Cook branded A330. Economy has 273 seats in a 2-4-2 formation with a seat pitch of 31 inches and width of 18.2 , the last 5 rows a offer a more roomier 2-3-2 formation, so if you have the option book these seats. As I reached my economy seat , I was grateful to find a free of charge pillow & blanket. Alas amenity kits are only given out in the premium cabin so dont forget to bring your own. Im 5′ 7, and I comfortably fitted into my seat , though anything over 5’10 and I think you’d would be in for a bit of a squeeze in a regular seat. So definately worth considering purchasing an exit row seat or check out the premium cabin review below for a few extra inches of leg room. This, in my opinion is where Thomas Cook could make its biggest improvement. Firstly you need to bring your own headphones, or you’ll need to purchase them onboard, though if your not going to upgrade to the premium package its hardly worth it. There are just four, yes this is not a typo four movies avalible to watch for free in the economy cabin, alongside 6 tv choices. On a 11 hour flight you could find yourself twiddling your thumbs for a large portion of the flight if you don’t come prepared. If you decide to fork out for the premium package (£5 ) there’s not exactly a massive choice ( 30 movies / 50 tv shows ) but enough to find something you like to pass the time. If you decide to bring along your own devices there’s an in seat USB plug, so you can keep everything fully charged throughout the flight. Included in your economy ticket you get two meals , as this was a 7.30 pm departure, dinner was served approx 90 minutes after take off. Its important to note drinks ( tea / coffee / juice ) are only free with your meal, all other drinks must be bought, but water is avalible for free through out the flight. There are always two food choices availible , I chose the chicken which came with rice and a few veggies. 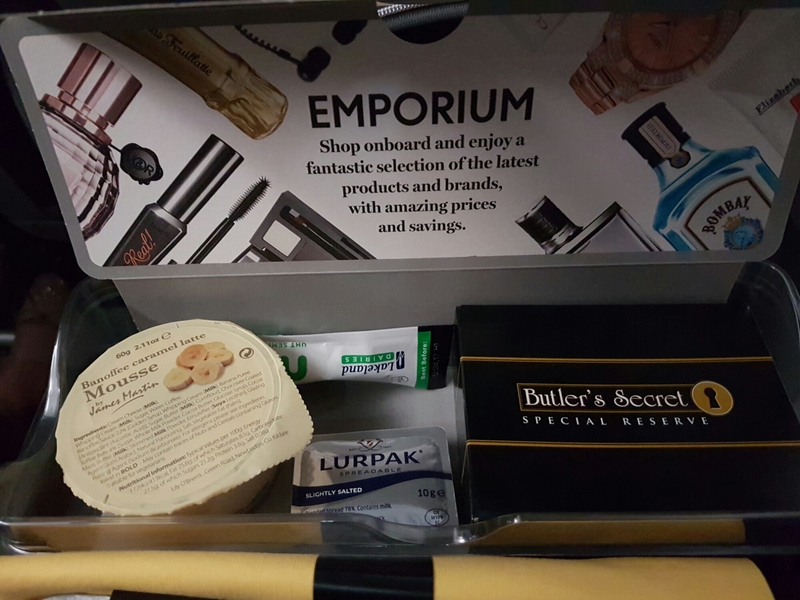 Whilst its not the best plane food i’ve ever eaten, it was totally adequate, it came with a box of extras below which helped stave off the hunger. If you do find yourself not liking the meal choices, there is food avalible to buy onboard , the choice is limited, but rest assured you wont starve. All alcohol sadly has to be purchased in the Economy Cabin. Breakfast is more of a snack, but as its served close to landing , you don’t have long to wait and I was happy with a cup of tea. 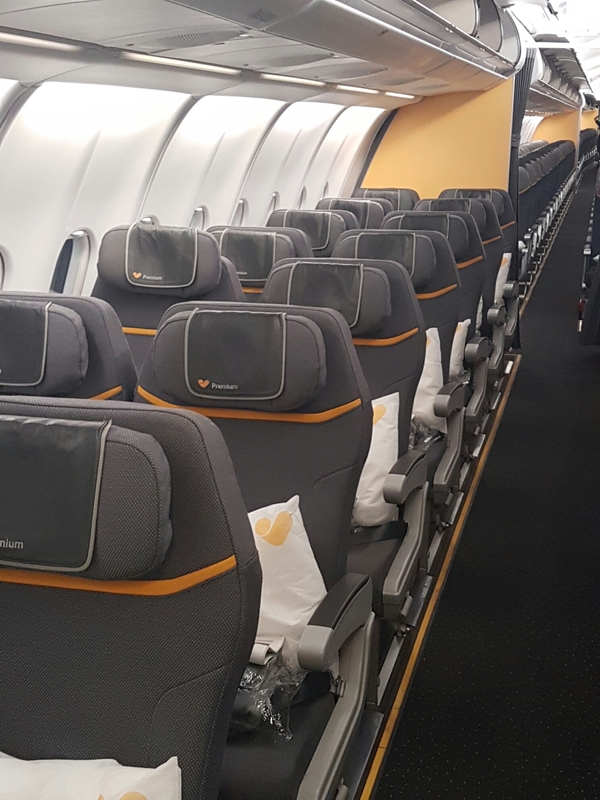 I was nicely surprised by my economy experience with Thomas Cook , in my opinion there is no difference between their service and British Airways world traveller service , in fact Thomas Cook inches ahead due to its refurbed cabin. Long haul in economy is never going to be a luxury experience, but it was certainly bearable and id be happy to travel long haul in this cabin again. Tips to remember bring snacks , headphones and load up the ipad with your favorite movies, and try secure the roomier rear seats and your ready for takeoff. 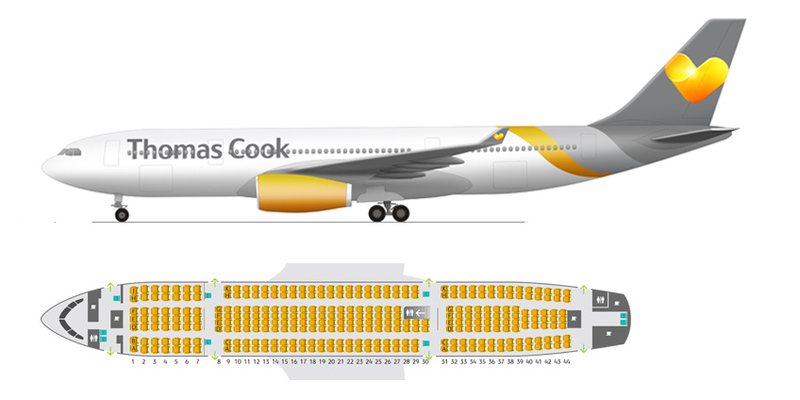 The Premium cabin is located at the front of the plane in its own separate area , with just 49 seats in a 2-3-2 formation. With a seat pitch of 35 inches and seat width at 19.7 and upto 6 inches of recline and adjusable head and foot rests. Most people should find these seats pretty comfortable. My only gripe about the premium seat is if the seat next to you is empty, theres no way of stretching out over the two seats due the barrier in between. In my seat there was an amenity kit , with a decent quality eye mask , ear plugs , lip balm , socks , toothbrush & paste and free headphones which honestly were pretty crap. I loved the world map case,which I’ve been reliably informed can be used as an i pad mini case, definately a keeper. Sitting in the premium seat i found the actual seat base extremely comfortable, and it’s amazing the difference an extra four inches of leg room makes. And just because your flying charter, doesn’t mean you have to miss out on your pre flight glass of champers. The inflight entertainment is slightly better in the premium cabin, with a choice of 30 movies and 50 tv shows free of charge to keep you entertained but I feel theres still room for improvement here. Approx 30 minutes after take off the crew started the first drinks service , and with only 49 seats in the cabin nobody is kept waiting too long. All drinks in the premium cabin are free of charge ( champange is only served on take off sadly ). Theres the usual selction of premium brand spirits plus mini bottles of wine, I found the Bottega rose extremely refreshing. About 90 minutes into the flight, dinner was served, instead of the crew dragging the trolley through the cabin and asking what you wanted on the spot, a crew member came round and discussed what was on the menu and personally took your order. 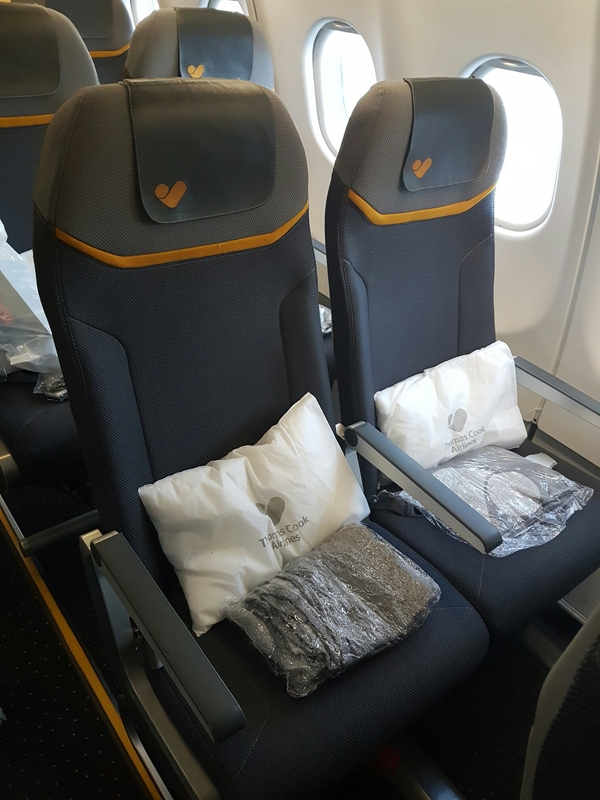 I loved this , I had the same experience when I travelled in business class on Etihad last year and its nice to see its something that Thomas Cook Airlines are doing. Its no secret that Thomas Cook Airlines are very proud of their collaboration with chef James Martin for their in flight meals. It was one of things I was most looking forward to trying in the premium cabin, the presentation of the meal was excellent , and the food was also way better than I expected. I went for chicken breast wrapped in ham with wedges and green beans , it was hot and succulent, which is no mean feat, as most chicken I’ve eaten on planes is usually dried out and tasteless. Sides of cheese and crackers , with a banoffee mousse for dessert. Breakfast was served around an hour before landing , to be honest I was expecting something a bit more substantial, especially as i’m not a fan of pasteries or muffins , but I was fine to make do with a cup of tea. The premium cabin is definately an upgraded experience in all areas of service. If your flying long haul, especially at night its definately worth blowing the budget. But theres only 49 seats available per flight , so you’ll have to be quick. Upgrades from economy are also available to purchase on the day if seats are available from £250 each way . Fares start from £269.99 one way, from London Gatwick, non stop to Cape Town, please note this route is currently a seasonal service between the middle of December to the end of March. it’s a good alternative to BA and usually much cheaper and the bonus of being direct as a lot of SA flights you have to stop in between , let me know how it goes !! Who did you contact to get this? I contribute to an aviation magazine and would live tk follow up on a piece I wrote about a visit to Thomas Cook’s Manchester Hanger. I would hugely appreciate it and be massively thankful if you could email me with some advice on who to speak too. Very detailed review of Thomas Cook Airlines! Great pictures and a very informative post. Hi, I’ve only flown with TK to Turkey and not great. I’ve never thought of long haul with them before but I may do now. Thanks for sharing. Looks as good and comfortable as a flight can be. Maybe I will try this Airlines for my next flight.